…the Defeat of Jesse James Days are almost here. Northfield Historical Society Executive Director Hayes Scriven and his crew set up the information tent in Bridge Square this morning in anticipation of this week’s big cultural festival. Wednesday, September 3rd, at noon, there’s a Graveside Memorial Service in the Northfield Cemetery (south Division Street, across from the High School) for Joseph Lee Heywood and Nicolaus Gustavson and at 6:30 p.m. there’s the Joseph Lee Heywood Distinguished Service Award Banquet, American Legion Ballroom, Highway 3 North. Thursday, September 4th, it’s “Townie Night” in the Entertainment Center at 5th and Water Streets and the Carnival on Ames Park at 5th Street and Highway 3 (known historically as Dahomey Avenue), a Tractor Pull on Division Street between 4th and 5th Streets, and a Northfield Historic Society Reception for Betty Barr, Jesse James’ Great Granddaughter. Jesse Jane’s Jamboree opens at the Northfield Arts Guild Theater on West 3rd Street at 7:30 p.m.
Friday, September 5th, the Entertainment Center, Carnival and Jesse Jane’s Jamboree continue. There’s a P. R. C. A. Professional Rodeo, 8 p.m., in the Jesse James Arena on Highway 3 South and a Square Dance on Division Street between 4th and 5th Streets. Don’t forget Bingo on Bridge Square, from 6 p.m. to Midnight. Saturday, September 6th, it’s the Jesse James Bike Tour, starting at the Northfield Middle School, registration from 6:30 a.m. to 10:00 a.m., the Defeat of Jesse James Car Show, from 9:00 a.m. to 4:00 p.m. at Riverside Park, a Fine Arts & Crafts Festival, from 10:00 a.m. to 5:00 p.m. along the Riverside Commons, a Craft Show in Central Park, from 9:00 a.m. to 5:00 p.m., and a Kiddie Parade at 10:00 a.m. starting at 6th and Division Streets. Sunday, September 7th, it’s the Jesse James 5 and 15 Ks at 8:00 a.m. registration in Bridge Square, the Royalty Reception, 10:00 a.m. at the Northfield High School, and the Grand Parade, 2 p.m. along Division Street. So, pull on your boots, hitch up your belt, tip your hat low over your eyes, and mosey on down to the Defeat of Jesse James Days, centered in the heart of Northfield, our historic downtown. I have been serving this week as a volunteer during the RNC in Minneapolis/St. Paul to show off the state of Minnesota to all the thousands of visitors. All the literature at the hotel concierge desks was totally devoid of any literature on Northfield or the Defeat of Jesse James celebration. I personally suggested a visit to Northfield to some delegates I met but I was only at one hotel. Why was no literature on Northfield or the DJJD submitted to the RNC organizers as this coincided with the dates of both events????? Good to hear from you. I hope you had a good time at the RNC. As you know, the Convention and Visitors Bureau takes the lead with marketing Northfield to visitors. I would expect that they supplied materials to the traditional channels. If you had any new ideas, you could contact them directly. I learned at the June NDDC Forum that the Defeat of Jesse James Committee spends less than $15,000 on marketing the event and relies on their 500+ volunteers. Basically, they bring materials to wherever they travel. I’m sure that there had to be at least a few DJJD Committee Members participating in the RNC, although it is a busy time for them. Right now the NDDC, along with the EDA and NEC, are focusing on recruiting businesses to Northfield. Our theory is that with 150,000 people coming to town, some of them must be decision-makers for businesses. 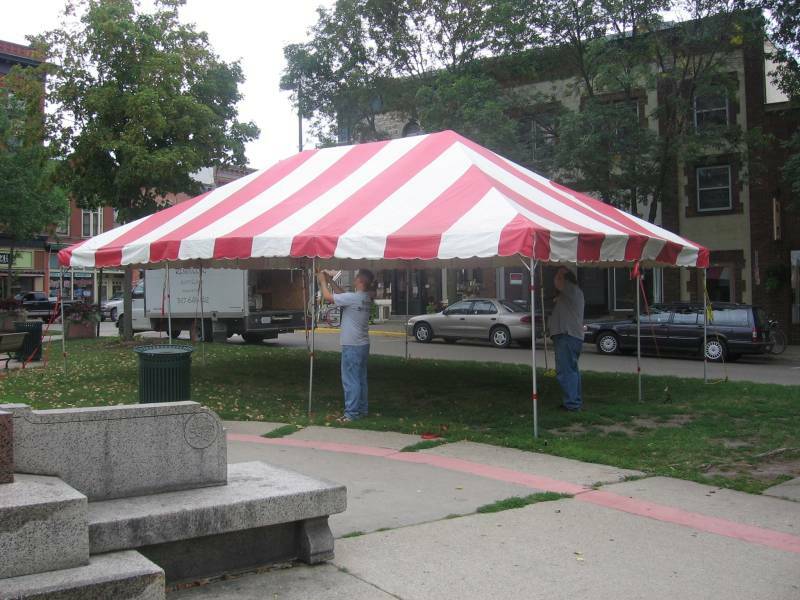 Therefore, all three groups have joined with the Northfield Historical Society in providing information in The Big Tent on Bridge Square.